I think I have a new favorite roast chicken recipe! 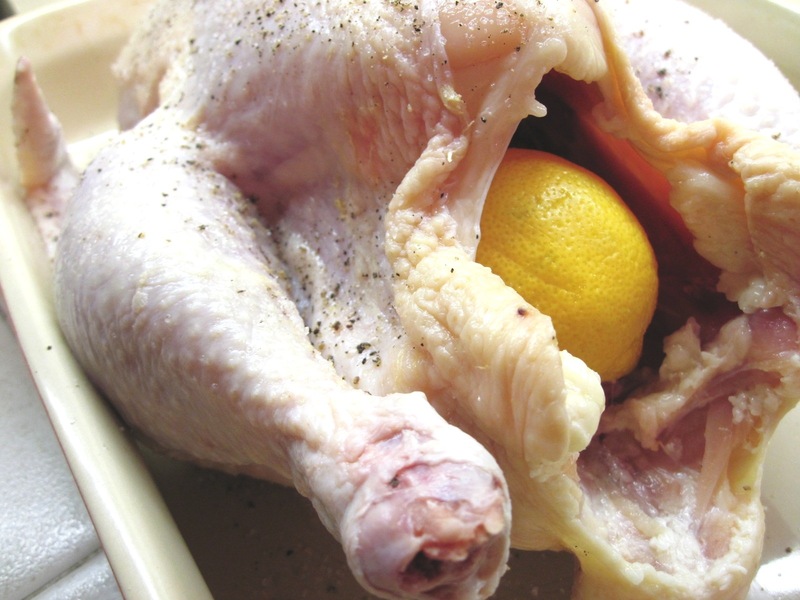 Marcella Hazan’s recipe for “Roast Chicken with Lemons” is in her classic cookbook, Essentials of Classic Italian Cooking. She said that over the years people have often commented to her about how much they love this recipe. If the chicken skin remains intact, the chicken is supposed to puff up as it roasts. Mine didn’t. But not to worry, Marcella reassures. She says the flavor won’t be affected if it doesn’t puff up. The chicken had great flavor (of course, I did start with an organic chicken) and it was incredibly moist. The leftover chicken was exceptionally good. I’ll definitely be making it again. 2. 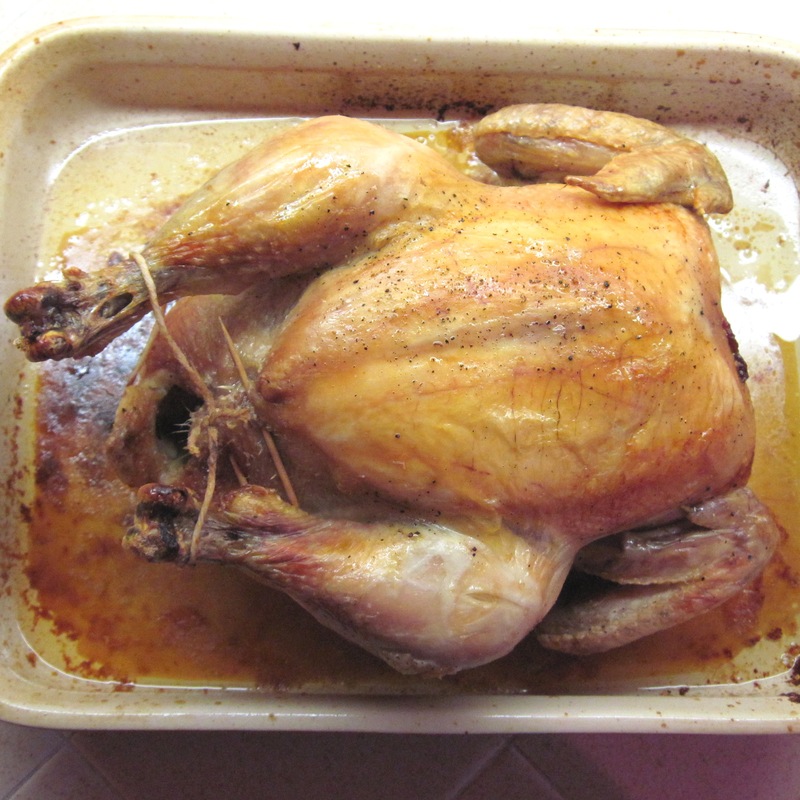 Rinse the chicken and dry it off inside and out with paper towels. 3. Sprinkle the chicken generously with salt, inside and out, and rub it in with your fingers. Grind some black pepper over the chicken. 4. Wash the lemons and roll them on the counter to soften them. Puncture them all over with the tip of a sharp knife. 7. Roast breast-side-down for 40 minutes. 8. Carefully turn the chicken over and roast for another 35 minutes. 9. Turn the oven temperature up to 400˚ and roast for another 20 minutes. 11. Serve with the delicious juices. *The roasting times worked perfectly for my chicken, which was just under 4 pounds. 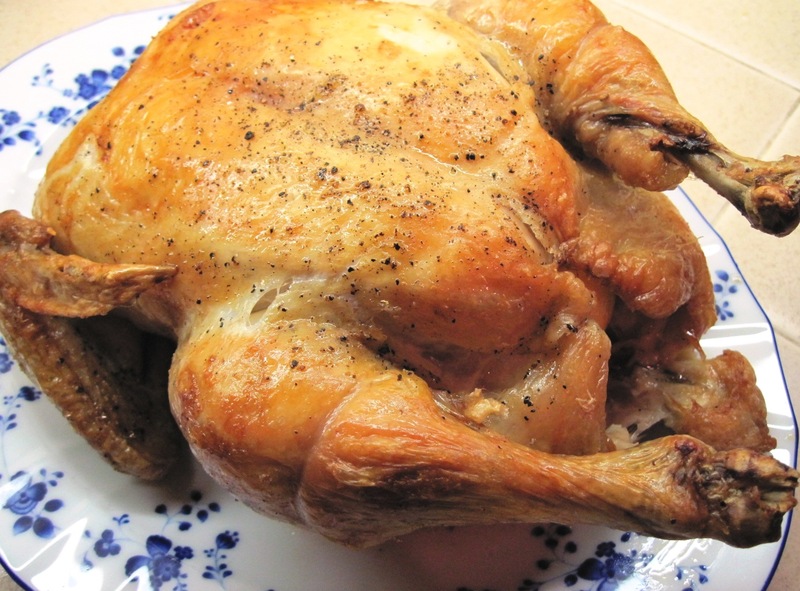 If you have a larger chicken (4 – 5 pounds) you’ll want to increase the roasting time a bit. It’s always good to use a thermometer to make sure it is done. The thickest part if the breast should be 160˚- 165˚. The thickest part of the thigh should register 170˚- 175˚. Roast breast-side down at 350˚ for 50 minutes. Turn over and roast for another 40 minutes. Turn the oven temperature up to 400˚ and continue roasting for 20 minutes. Do you think that it will make a difference if I make this in the crockpot instead of the oven? I don’t think it will turn out quite them same in a slow cooker, but you could definitely give it a try. Some chickens are so big that they wouldn’t fit in my 3 ½ quart slow cooker, so keep the size of your slow cooker in mind when buying the chicken. To make it in the slow cooker, I would follow steps 2 – 6 in the recipe. Then crumple up some aluminum foil so you have balls of foil and put them in the bottom of your slow cooker. Put the chicken breast-side down in the slow cooker and cook on Low for 8 – 10 hours. Timing will depend on the size of your chicken and how hot your slow cooker cooks. In the end, it will probably taste quite good, but it may fall apart when you take it out of the slow cooker. Thanks for your comment. I may have to try it in the slow cooker myself! Update November 17, 2010 I tried this in my slow cooker yesterday. It was okay, but it did fall apart. The flavor was OK, but it was overcooked and did not have the flavor and texture of a roast chicken. It was an interesting experiment.